Soaking potatoes ahead in warm water with sugar worked wonders, but borrowed technique from Alton Brown by first frying at 320 deg. until potatoes just began to float, removed from oil, and drained then increased frying temperature to 375 deg for a second quick fry (watch the fries carefully - the difference between crispy fries and shoestring potatoes is just very far apart!). 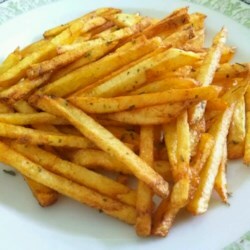 Had been looking for a "perfect" french fries recipe for a long time and this one is the closest to perfect yet!